Join us on a sleigh ride with your family, friends or loved ones. 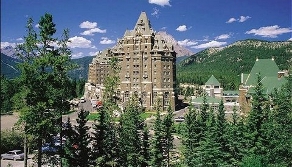 Relax as you become captured by the breathtaking views and sparkling winter air of the Canadian Rocky Mountains. The one hour sleigh ride will take you through the Bow River Valley showing you the remote areas around Banff western style. Sleigh rides are available every hour on the hour, 7 days per week. We offer a romantic sleigh ride package perfect for just the two of you. Hotel Pick up is not included for sleigh rides. Guests must meet at Warner Stables. Snuggle up to your loved ones on a horse-drawn sleigh ride through the Canadian Rockies. 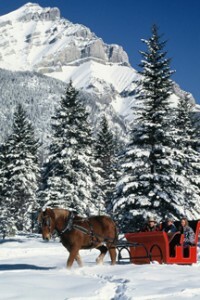 Banff Travel offers both public and private sleigh rides that take guests into the beautiful and secluded countryside of the Canadian Rockies. The public outing takes guests on a scenic 45 minute ride along the Bow River. Your adventure will take you to remote areas where you can truly enjoy the great outdoors experience. Couples are encouraged to purchase a romantic private tour through the snowy woods. The private sleigh ride provides chocolates and liqueurs, in addition to a Buffalo Robe to keep couples warm and toasty on their Canadian Rockies adventure.